My family loves pork. I'm pretty sure my husband could be a perfect vegetarian, as long as he could eat pork. I think that he needs to invent a term for this, maybe porcinatarian. He would be a perfect poster child for this movement. Given my family's love of everything pork related I have learned to make a large number of pork recipes. Some have turned out great, like any type of pork taco, others such as a curried pork tenderloin recipe I tried last year where pretty horrible. Bacon is always a popular option. If I mention a dish includes bacon my family will come running to the table. There is one other food that my two boys in particular absolutely love, sweet peppers. My oldest has been known to eat an entire red pepper like an apples, he loves them. 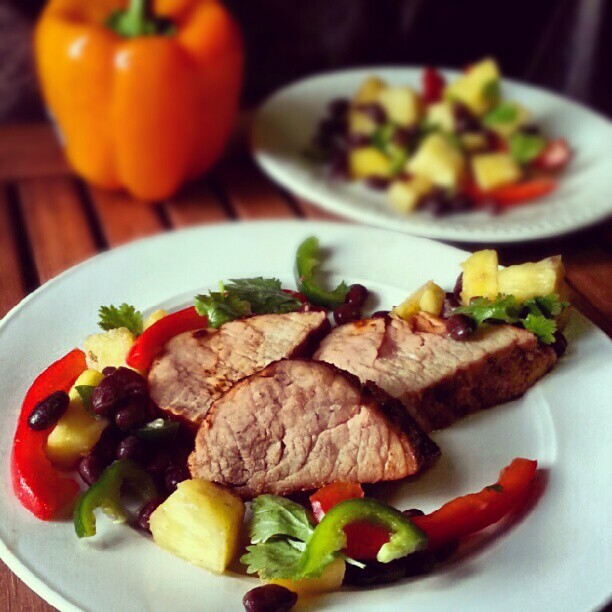 Recently, as I was looking through the May issue of Woman's Day magazine I came across a recipe for Barbecue-Rubbed Pork Tenderloin with Pineapple Salad, which looked delicious and low in fat. This recipe has 12 ingredients. It takes a total of 30 minutes, 25 minutes of which is active and makes 4 servings. I had no problems finding any of these ingredients and I made no ingredient modifications. I did run out of ancho chili powder, so I used a combination of ancho and chipotle chili powder. Since I was making this recipe for my children, I made two different salsas. In one I used jalapeno and in the other I did not. I do this with a lot of recipes, make a slight modification for the part of the servings for my kids. That way we are still all eating the same dish, just with a milder version for the younger tastebuds. My tenderloin took exactly 18 minutes to cook and then 5 minutes of rest. I let my salsa sit in the fridge for an hour. I would definitely recommend letting the salsa sit in the fridge and chill, it enhances the flavor. I followed the remainder of the recipe as written. I was really impressed with this recipe. The combination of sweet and spicy was delicious and even my two boys loved the pineapple salad. I like how the pork is simply seasoned, without a needless amount of extra spices. I would suggest that if you don't like a lot of spice reducing the amount of chili powder. Since my family tried to eat low-fat dinners most of the week, I really like that this recipe only has 8 grams of fat and 37 grams of protein. Overall, a very easy and nutritious dinner recipe. For the recipe go to Barbecue-Rubbed Pork Tenderloin. Welcome to the porcinatarian club! LOL! Pork rocks!! I agree, pork is the best :) Happy weekend back! Looks delicious! Following from the Aloha Blog Hop. Thanks for participating! Just stopping by to see what you had new. This looks sooooo good. Thanks :) It really was good and low in fat!